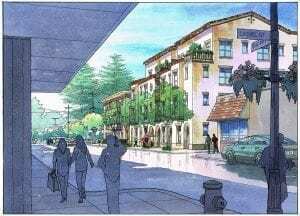 I just completed this watercolor rendering of a proposed residential project near San Francisco, CA. The architect is Van Meter Williams Pollack Architects of San Francisco. I have been posting the progress of this rendering each day since I did the first sketch. There are basically four stages to my rendering process–a 3D computer model, then a rough sketch, then a more detailed black and white tracing, then the color–in this case, watercolor. With this rendering project, the architect–my client–provided me with the 3D CAD model and gave me the perspective angle selected to be the best for marketing purposes. I then print that perspective view at 11 x 17 inches, then add people, cars, trees, streetlamps, etc. using Google Earth as a reference for the existing elements that are around the site now. I do a quick sketch of all that using a transparent sketch paper–just loose freehand felt pen. I throw that sketch on the scanner and send it via email to the architect for approval. Usually we tweak a few things to get it just right–either architectural details or entourage elements. The next step is a freehand–but more detailed and carefully-drawn–felt pen line drawing, tracing the outlines basically like a coloring book. That drawing gets scanned and sent to the architect for approval to go ahead and add color. More than any other phase of the process, the color phase is where the artist’s vision comes into play in a big way. In this rendering, my goal was to keep all of the light and white areas of the painting in the subject itself–the four-story building which is the subject here. In doing so, the viewer’s eye will naturally focus on the building. All of the foreground elements and the adjacent buildings and trees are support elements–they should all be shown–but shown quietly with cooler, more neutral colors and tones. If I had included bright spots of white or color in the surroundings, the composition would have lost its focus, and these elements would have become distractions to my intended feature–the bright, sharp building in the center !